Mounting failures of replication in social and biological sciences give a new urgency to critically appraising proposed reforms. This book pulls back the cover on disagreements between experts charged with restoring integrity to science. It denies two pervasive views of the role of probability in inference: to assign degrees of belief, and to control error rates in a long run. If statistical consumers are unaware of assumptions behind rival evidence reforms, they can't scrutinize the consequences that affect them (in personalized medicine, psychology, etc.). 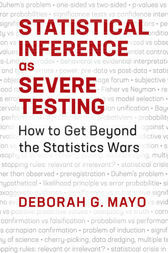 The book sets sail with a simple tool: if little has been done to rule out flaws in inferring a claim, then it has not passed a severe test. Many methods advocated by data experts do not stand up to severe scrutiny and are in tension with successful strategies for blocking or accounting for cherry picking and selective reporting. Through a series of excursions and exhibits, the philosophy and history of inductive inference come alive. Philosophical tools are put to work to solve problems about science and pseudoscience, induction and falsification.